Browse Artists and Groups Maurice Cullen, R.C.A. Maurice Galbraith Cullen was born in St. John's, Newfoundland on June 6, 1866. He was the only child of James Francis Cullen, a metalworker from Torbay, who had met his wife, Sarah Ward, on a visit to Montreal. They married there at Saint Patrick's Church on August 8, 1865. Little information exists about Maurice Cullen's childhood. According to his stepson, Robert Pilot, the family moved to Montreal when he was four years old and Cullen regarded Montreal as his home for the rest of his life. Aged fourteen, in 1880, Cullen began work as a sales clerk in the Montreal dry goods firm of Gault Brothers. He remained for four years and for one brief week was promoted to accounting clerk, but he spent his time drawing in the margins of the ledgers and as a result was sent back to being a sales clerk. According to Robert Pilot, it was during this time that Cullen started drawing and studying sculpture in the evenings under Louis-Philippe Hébert at the Monument National. Cullen told his stepson that he helped Hébert with the carving of the apostles and saints for the roof of Montreal's Roman Catholic Cathedral. Cullen's mother died on August 17, 1887, leaving him a small inheritance of two thousand dollars, which he used to further his studies in Paris. By November 1888, he was auditing the classes of Léon Gérome at the École des beaux-arts and simultaneously studying at the Académie Colarossi under Gustave Courtois (1853-1923) and J.A. Rixens (1846-1925). In 1889, Cullen successfully completed the examinations for the École des beaux-arts and was introduced to the strict teaching approach that had been used for generations; everything was codified by subject matter, technique and themes. At the same time Cullen also attended the Académie Julian where one could work unrestricted. Here he met three Montreal acquaintances, Joseph Franchère (1866-1921), Joseph Saint-Charles (1868-1891) and William Brymner (1855-1925). He also met many of the leading Impressionist artists working in Paris at the time. "Mr. Cullen rather inclines towards the impressionist school and that is certainly not a reproach on our part because this tendency proves the artist's horror of triteness, which should be discouraged. He's just completed two landscape compositions in this vein which are now on exhibition at the American Student Association on Boulevard Montparnasse - two very personal and promising works." In 1890, a number of artists, including Auguste Rodin (1840-1917), Puvis de Chavannes (1824-1898) and Louis Ernest Meissonier (1815-1891) revitalized the Société Nationale des Beaux-Arts (known as "la Nationale"). Cullen exhibited at La Nationale in 1894 and 1895 and became an associate member in May 1895, the first Canadian to be so honoured. Cullen spent his vacations on the Brittany coast, where he was close to James Wilson Morrice (1865-1924). They painted together, both in Brittany and Venice, as they were later to do at Beaupré and Québec City for several winters. In 1895, Cullen decided to return to Montreal. He opened a studio at 98 Saint François-Xavier Street and exhibited at the autumn exhibition, Kermesse, which was a benefit for the Notre Dame Hospital in Montreal. On December 14th, 1895 a friend from his years in Paris, William Brymner, introduced him to the Pen and Pencil Club of Montreal. During the winter of 1897, Cullen and Morrice painted on the Beaupré coast and Cullen began to paint the winter landscapes with wonderful northern light that would eventually be one of his trademarks. Although he exhibited in a number of exhibitions and galleries, his paintings did not sell well in Montreal at this time. The wealthy merchants were interested primarily in the Dutch 19th Century School, especially the Hague School, and various English artists from the late 18th and early 19th centuries. Cullen was elected an associate of the Royal Canadian Academy in the spring of 1899. This election may have given him the public exposure that he needed to sell paintings, as from this date his works sold. 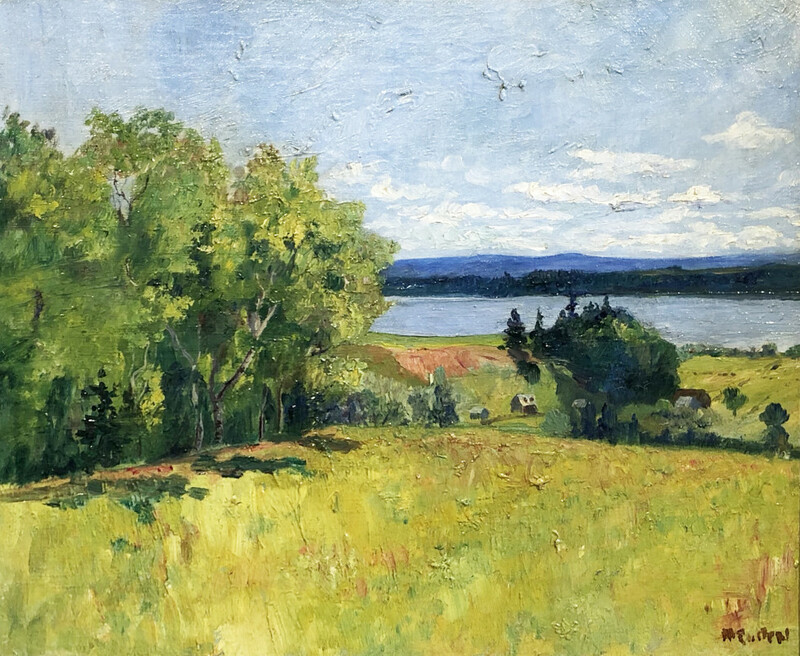 He used impasto, building layer upon layer of paint to achieve texture; this technique also influenced other Montreal artists of the time, including William Brymner. "Then began a period of intensive study of the effects of light upon snow with all its intricate system of complementary colours and reflections. Few have equaled his sureness in interpreting this aspect of nature. Working year after year at Quebec, then further afield at Beaupré and Les Eboulements, he followed the seasons round from smiling summer through brilliant autumn to gleaming winter. He also traced the hours of the day to record the transitory play of light. "At some hour of the day" he observed, "the commonest subject is beautiful."" In 1907, Cullen was elected a full member of the Royal Canadian Academy. He was also invited to exhibit at the newly created Canadian Art Club, which did not represent a specific school, but was a co-operative society of artists who had come together for mutual benefit. This club exhibited primarily in Toronto, where the public and collectors were beginning to take an interest in Canadian art. Cullen visited Newfoundland in 1907 for the first time since he left in 1870. His father was still living in St. John's and this was presumably one reason for the visit. The island had no resident artists at this time and Cullen was able to produce a series of works depicting the colourful island landscape. Here, Cullen met Barbara Pilot, a widow with five children, and they were married on November 3, 1910. The next year Cullen brought the family back to Montreal. The youngest stepson, Robert, became very close to Cullen and later was greatly influenced by him when he became an artist. Starting in 1911, Cullen began teaching at the Art Association of Montreal and for the next thirteen years taught sketching classes. 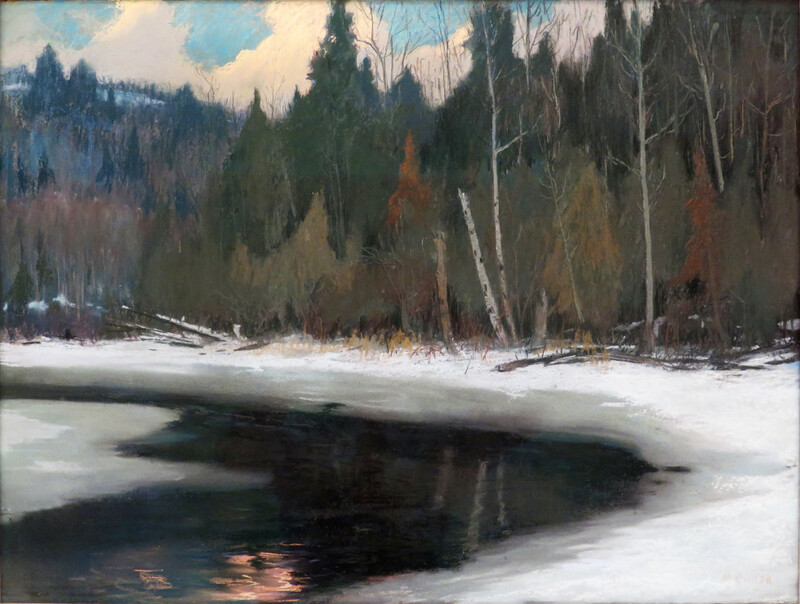 Many prominent artists received their first landscape instruction from Cullen, including Edwin Holgate, Mabel Lockerby, Robert Pilot, Anne Savage, Kathleen Morris, Sarah Robertson and Prudence Heward, all of whom were members of the now iconic Beaver Hall Group. After 1903, Cullen regularly exhibited pastels. He learned the pastel technique from one of his teachers at the École des beaux-arts in Paris, Philippe Roll. Cullen made his own pastels from earths and other pigments and they were usually "fixed" to prevent smudging. He used them for their expressive quality and also due to the fact that they were very portable and combined well with pen and ink. "He was a great believer in making preparatory studies for his pictures. Many hundreds of sketches give evidence of this. He was remarkably sensitive to the atmosphere which enfolds all objects in nature and lends them charm and mystery as they recede into space. He was concerned always with "value" - a term difficult to discuss except with painters, though perhaps it may be called the reciprocal relationship of colours with reference to light. He firmly believed also that the artist should be a fine craftsman, and his pictures bear out this belief, for one rarely sees cracks or faded colour. Several experts who have cleaned his canvases have remarked on the solidity of the fracture and the ease with which they may be restored. This of course was due to the use of a limited palette of chemically pure pigments and to his method of applying them. Surface or "paint" quality was something of which he often spoke and which is generally found in his work. Though he did not follow the divisionist technique of the impressionists, he strove while mixing a tone on the palette to keep the colours as separate as possible, so that the liveliness and vibrancy would be achieved. Moreover, he regarded quality in oil painting as something involving solidity, and thus he build up his canvases with impasto. He remarked that the surface of a picture should be a unity, handled thickly throughout, or the reverse." In 1918, Cullen was commissioned by the Canadian Government to become one of the official war artists. He was sent to the Western Front in France to sketch and paint the carnage of war. In all, sixty-three known works were produced, the last five of which were handed over to the government in April 1920. 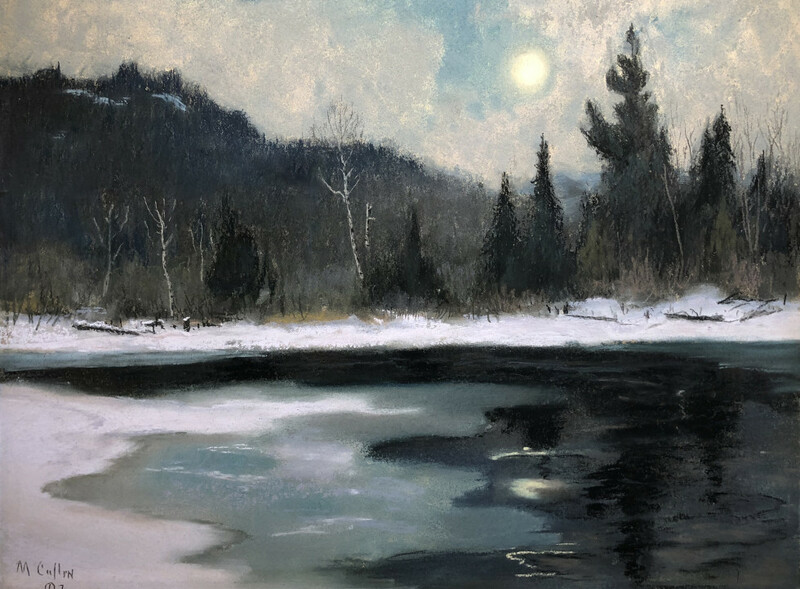 "In deep winter under a canopy of snow, where the woods are a silhouette of black against a shimmer of radiant light, Cullen paints his poem to the glory of the Laurentian winter. In his pictures one feels the very mood of hushed solitude, the exquisite silence of the snow-enshrouded world. It is indeed the very soul of this country that he paints. The forests to him are the perpetual forests of virile unsullied nature, never are they the woods of the passing hunter or the limits of the timber merchants. It is this larger vision of things, this deeper aspect that creates the intellectual and emotional appeal in Cullen's art." Cullen was given two large retrospective exhibitions during his lifetime. One in 1930 was sponsored by the Quebec Government. This was the Rétrospective des OEuvres de Maurice Cullen-Troisième Exposition Annuelle d'Artistes Canadiens at the École des beaux-arts de Montréal. The other, in January 1934 was organized by the Watson Art Galleries in Montreal. By 1926, Cullen was suffering from diabetes and moved from Montreal to Chambly where he could live at a slower pace. Until 1932, he continued to paint and prepare work for his annual exhibition at the Watson Art Galleries. He died on March 28th, 1934. Where does Cullen stand in the history of Canadian art and what influence has he had on his contemporaries and successors? It is already apparent that the brought to Canadian landscape a completely new vision. He was the first to interpret our landscape in a manner both personal and appropriate to the country. Though inspired by the impressionists, he nevertheless adapted their approach to suit another climate and another hemisphere. At first, seeing the farmlands of the lower St. Lawrence as a re-creation of the gentle fields of France, though perhaps in ruder guise, he was able to interpret the dwelling places of the transplanted French of Nouvelle-France. 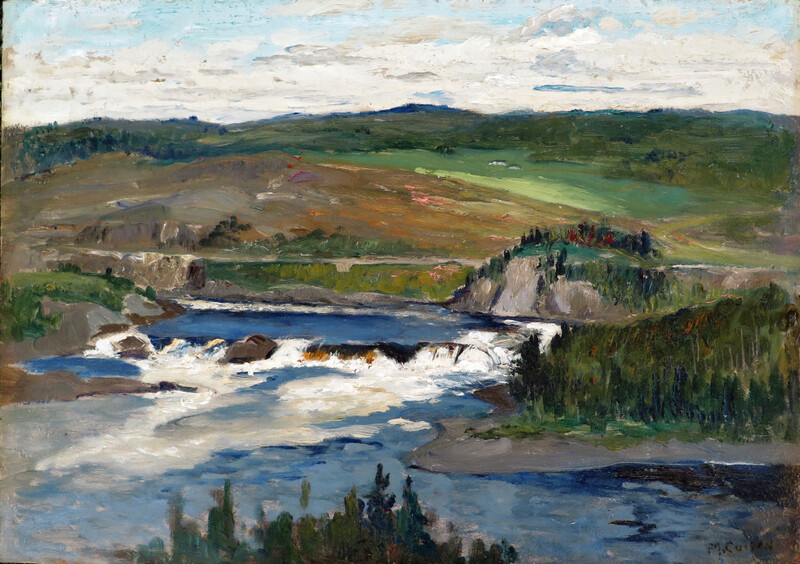 Later, however, he painted the hinterland of this region and eventually the solitary, untouched area of the Laurentians. His impact upon other artists resonates to this day, particularly with the recent proliferation of interest in the Beaver Hall Group. © Copyright Conrad Graham and Galerie Walter Klinkhoff Inc. Please send me more details about the following artist. Maurice Cullen, R.C.A.